Speaking of wet shaving it is impossible not to mention the classical T-shape safety razors. Why? Because they revolutionized the shaving process and changed all previous notions about it. They made obsolete former straight razors and became a starting point for the evolution which has resulted in the safety razor we use now. T-shape razors, also known as double edge safety razors, are classified by the form of the shaving head. And the shaving technique also depends on it. The usual classification of shaving heads is as follows. The Colsecomb, or the straight cut, is considered the classical option for everyday shaving. Such shape of the razor’s head guarantees the most convenient use of the razor. The Open comb, or the serrated edge, is best suited for men shaving not too often – about two times a week or even less. The edges made as little combs part the hairs in the process of shaving. That ensures more tight contact with the skin and precludes pulling out the hairs even if the bristle is long, matted and tough. Razors with the Slantbar, or the slanting cut, shaving heads are the most complicated in use. Such razors aren’t recommended for beginners. Due to a changed geometry of the blade, the acting force is slightly biased. Instead of being cut frontally, the hair is saved, which allows more close shave. 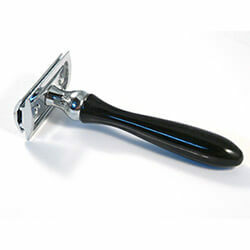 For a comfortable shaving with a “Slantbar” razor head type, the placing of the blade in the razor is very important. When you change the blade, you should take care that the cutting edges on both sides of the shaving head had the same width. In other words, the cutting edges must be parallel to the fixating lid of the shaving head. The most popular safety razors manufacturers are Merkur, Parker and Edwin Jagger.